An artistic map to present a variously textured type of motorcycle I made with the Sauerbraten editor. Check the link for a short video about the map. Nice to see some artistic map, but the details which really matters have just been copy-pasted several times and then retextured (as the bike is). Seems like you forgot to use texscale at the mirror which stands next to the white bike that is positioned on some platform? The white bike on that platform still have some texturemistake at the seat. The snow7 texture which is in the tomek folder is sticking out from the seat, while the rest of the motors (and the other side of the motor) isn't having that. The cloudcolor isn't appearing to fit the skybox at all. What about setting it some darker? I expected more than just this actually (in overall), but I like the bike. I definitely wouldn't give 10/10 to the content, because I've seen you making way better things than some motor shop (and also better things in general, when I only have to judge on details). 7/10 so far. Thanks Suicizer, too bad that there were still texture failures on that bike, I fixed them and the mirror and deleted the clouds. I noticed that there's a few cars in Sauerbraten that are used and copied alot in coop so I thought it may be good to have a free motorcycle uploaded here too. I didn't want to post an empty map with standing-alone bike or a few variously textured motorcycles in the center, without anything putting it into context. 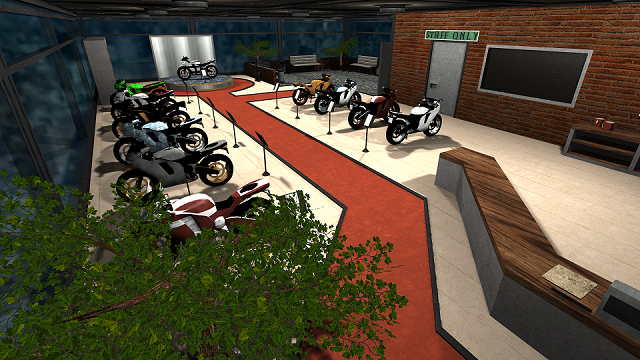 I have to admit, it's not a bad looking shop, but I was just expecting different kind of bikes. What about some maintenance room below the shop?